With a fantastically flashy coloration and perfectly symmetrical form, the golden split-cup blooms of Mondragon will set landscapes ablaze with striking beauty and hues that are hot! 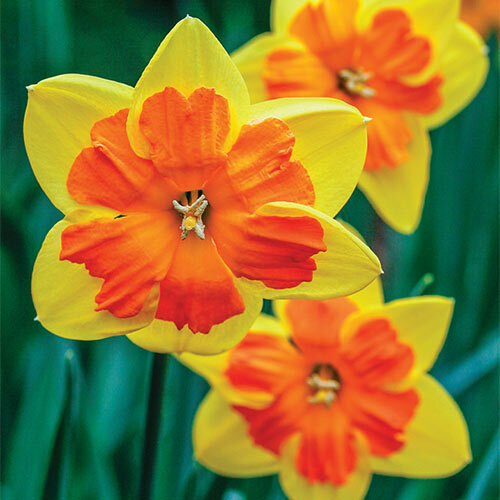 Each 4¼" daffodil bears vivid golden-yellow petals surrounding a deep, rich orange cup. Mondragon's unique shape showcases cups that lay flat against the petals—sure to become an eye catcher in midseason borders, decorative pots and mixed cutting gardens, too. Customers will love the sweet fragrance and pop of springtime color Mondragon adds to cut-flower bouquets and fresh floral arrangements. Plus, the blooms sit atop strong 20-24" stems, keeping them upright and visible. Daffodils naturalize readily, reappearing year after year with increased vigor and in greater numbers.